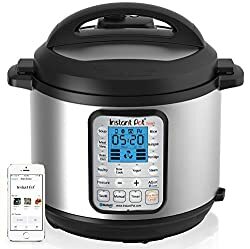 InstaPot / Instant Pot Review 2018 – 2019: What are the Best Instant Pots to Buy? What is the Best Instapot for your Family? 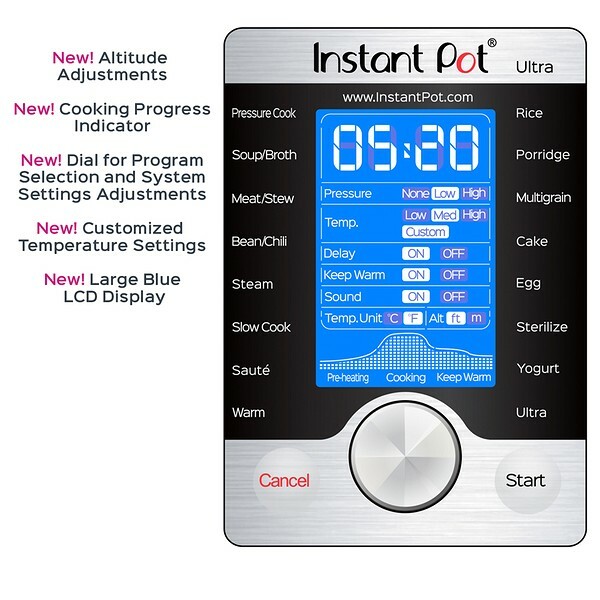 But Which Instapot Do I Get? So why did we choose Instapot Ultra over the other Instant Pots? We live in an age of technological marvels, with devices and implements (such as the new Instapot) that save us time and money, allowing greater connectivity than ever before. However, it seems that these time savers just mean that more demands get pushed into every moment of our day. People are expected to work on the way to work, on numerous occasions. More things mean more chores, more maintenance, and more of our day filled with things we have to take care of. This often means that we have to seek compromises somewhere, and all too many people make these compromises in their diet. 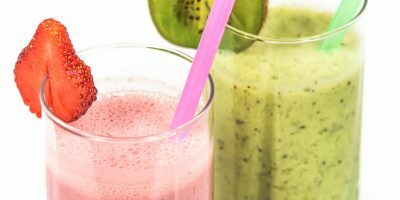 Fast food, microwaved dinners, and junky on-the-go snacks take the place of wholesome, varied nutrition in too many cases. There just isn’t enough time in the day for some people to cook the healthy food they need in their life. Let’s face it, cooking takes time. Even a relatively simple lasagna or casserole can take two hours to prepare and cook, which doesn’t account for clean-up time. Quick meal solutions save us that time, but leave out the healthy, fulfilling element that good food brings to our lives. Thankfully, that age of technological marvels has brought a number of kitchen appliances into our lives that can save time. 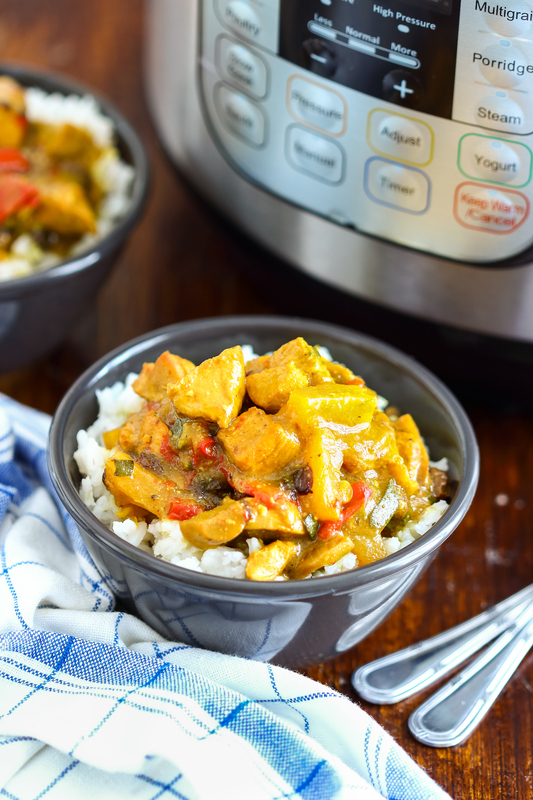 The one we want to talk about here is the Instant Pot or Instapot, a multi-function device that will prepare multi-ingredient, healthy, hot meals with less time and effort spent in preparation. The Instant Pot ultimately has its roots in the slow-cooker concept. The common term is Crock Pot, though much like Kleenex, this is just a brand name that became common usage. A slow cooker at its heart is a single pot that’s used to heat and warm meals, keeping them in a single, central device. The modern hot pot or slow cooker concept originated with Irving Naxon in the 30s, for a bit of interesting historical trivia. In short, a slow cooker consists of a central heating pot that is inserted into a mechanical heater. Plug it into the wall, fill the pot, heat it up for some hours, and bam, stews and other slow-preparation meals are ready to go a few hours later. The devices have evolved over time, with mechanical timing devices being replaced with digital and LED displays. Some models even have programs to use, allowing for different heating patterns based on what you wish to cook in the device. One core problem remains, however, and that is the word “slow” in slow cooker. A good, hearty soup or stew can take up to six hours to make in a traditional slow cooker. Heat and cooking are handled, but the tradeoff in time makes it a tool for specialized use. The general solution is to prepare a meal early in the day, set the pot cooking, and then come back to it much later after other things have been taken care of. However, sometimes you need a good meal and you need it in a short time. A pressure cooker is built in similar fashion to a slow cooker, consisting of the base heating unit and the central pot with lid. The difference is that a pressure cooker lid seals down with an airtight bond. This keeps heat and moisture inside, and builds up the pressure in the central container. Added pressure increases heat. In the case of a pressure cooker, this means that food cooks faster and more evenly than with a traditional slow cooker. Pressure cookers have become quite popular in Europe and Latin America, but have been slow to catch on in the United States. This is partly due to the fact that early models of pressure cooker were temperamental, and several well-publicised accidents involving pressure cooker explosions kept the technology less popular than other methods. However, newer and recent technologies have improved the safety and efficiency of these devices. The most interesting and popular pressure cooker currently around is the Instapot, which we’re going to discuss today. Starting in the early 1990s, Instant Pot began entering the pressure cooker market. Their name was chosen to reflect the reduced time and energy required to prepare a meal in their pressure cookers vs traditional slow cookers. This was on the tail end of the early years of pressure cooker design, with mechanical wind-up timers and minimal controls. Toward the mid 90s, mechanical controls were replaced across the board in kitchen appliances with digital ones. Instapot introduced a number of features at this point, taking full advantage of the new tech. Delayed start functionality brought the slow-cooker concept to its ultimate evolution, allowing a meal to be prepped and to start itself later on. This was the point at which Instant Pot’s designers also began incorporating digital safety features. Most pressure cooker explosions resulted from an improperly seated lid. As the pressure built up, it eventually blew the lid off and threw food and the cooker around in a violent burst. Instant Pot incorporated features that refused to let the device start if the lid wasn’t properly secured. This is the current series of Instapot devices, and showcases the real, powerful benefits of using these appliances. They’ve taken advantage of the latent potential of their technology to include smart programming options, incorporating sophisticated processors and computer technology, allowing for finer and more effective control than at any time in the past. If you’ve decided to research Instant Pots, you’ll see that there are currently five models offered by this company. You might be wondering which one is ideal for your family’s needs at this point. While it’s true that every family will have different needs, and thus there is no single choice that will apply to everyone, we have still worked through the features of the models we know about in order to offer you the best information, and to give you our top pick. Our Top Pick is Instant Pot Ultra (10 in 1). We chose it because it comes with maximum features and price is also in the range of most consumers. For our money, the Ultra model wins Editor’s Choice hands down. We will explain the basic features, so let’s go into more details. In any popular and successful product line, there will eventually be a “deluxe” model for people to take advantage of. In the case of Instant Pot, it’s the Ultra model. Incorporating the best features of any of the models available, the Ultra is our Editor’s Pick for the Instant Pot series of pressure cookers. The Ultra is designed as a 10-in-1 replacement for your assorted kitchen appliances, saving you time, money, and space by eliminating the need for many other appliances. If you’ve ever looked at your slow cooker and thought you could do better, the fact is that you can, and the Ultra is the way you do it. With a combination of digital and pseudo-mechanical functions including a central dial, you can adjust and tweak the programs to fit your particular cooking style and favorite recipes. It really is flexible enough to handle nearly three quarters of assorted hot cooking recipes, from breakfast foods to desserts. The Ultra can stand in for an egg cooker, baking oven, steamer, slow cooker, rice cooker, and general food warmer. Just like other pressure cookers, it uses forced pressure and heat to speed up the cooking process. As we said before, nearly three quarters of the recipes available out there take under half an hour to cook once preparation is finished. The Ultra has a number of special considerations built in as well. You can adjust the programs to account for altitude. Cooking at higher altitudes is different due to the change in air pressure, making cooking times take longer. With a few button presses, you can configure it for your specific altitude for maximum cooking precision. A handy steam release button is included if you wish to stop the cooking process, or are concerned about over-pressurization in your Instant Pot as well. Per the usual, the Ultra includes complimentary utensils and accessories, including recipe book and steam rack. It’s ready to use directly out of the box if you wish, without an extended or complicated setup time. You can customize the programs, and keep tabs on temperature, pressure, and even heat intensity with the Bluetooth integrated app for the device. The Ultra is the newest, shiniest model of Instant Pot, and includes 11 safety features integrated into its design. The steam release and reset feature is the newest and handiest of these. Do exercise all appropriate caution, however, as steam is still hot and quite dangerous to the touch. As with other models, it has UL and ULC compliant certification for all safety features, giving it an industry standard level of reliability and efficiency. The first feature to consider is that the designers have included 14 cooking programs into the computer of the Instant Pot Duo. These include pressure cooking, simmering, and sautéing, giving you a great deal of flexibility. It can cook rice, soups, meats, and even yogurt. There are also baking functions, allowing tasty desserts such as cakes to be made with a little creative preparation and very little time. The cooking pot is made from food grade, stainless steel. This reduces the chance of buildup contamination, allowing for a healthy, food-safe interior to cook with. The 3-ply bottom and high-grade pressure seal provide even, intense heating and a near perfect chamber seal, keeping nutrients in and helping kill off foodborne bacteria. Remember that proper heating and cooking results in the healthiest food, so an even and high pressure cook is a good way to maintain food health. The DUO offers a sophisticated microprocessor as its core unit governing the cooking process and programs. This makes cooking a snap, monitoring cooking times down to the second for you, freeing you up to take care of other tasks. This processor self-adjusts, turning off active heat to allow ambient heat and pressure to take over, so food cooks properly instead of burning or overcooking. Creative users have used it for canning, both through boiling water and through high pressure canning. There are a number of sites out there to offer canning advice with the Instant Pot, and if you’re interested in long-term food preservation, you should take a look at these, as it will reward your interest. An often overlooked features of the Instapot Duo is that it is incredibly quiet. It’s virtually silent during most of the cooking process, with barely a hum of electronics working. Further, the high pressure cooking chamber keeps the heat sealed in your Duo, rather than radiating into your kitchen. Even the best oven spills waste heat, and can heat up a kitchen. During the Summer, this is unacceptable. The Duo helps you sidestep this problem, reducing energy waste spent on cooling a house. Another creative addition is the ambidextrous design. Lid holders for both right and left handed users are provided, allowing you to use your dominant hand instead of improvising. The stainless steel body keeps fingerprints away as well, reducing time spent wiping down and cleaning the surface. UL and ULC inspectors have tested the Instant Pot in stressful circumstances, focusing on the most common pressure cooking failure points such as improperly seated lids. Both authorities approved the Instapot DUO, which incorporates ten different safety checks into its design to prevent dangerous kitchen disasters of hot, exploding food. Comes with a solid accessory pack of dedicated, cooker-safe utensils. 14 programs on-board, with a variety of functions. Extensive safety features and programming. 3 ply bottom and solid pressure seal for even, consistent heating. Push-and-Go functionality, very easy to use. Very high heat buildup can surprise some cooks, must exercise caution in transferring the central vessel. Steam and heat release can be greater than expected. Some reports of electrical malfunctions exist. Small learning curve during initial use. 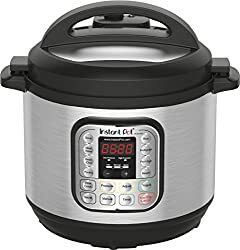 Click here to see the price of the Instant Pot DUO 80 on Amazon. Where the Duo is good at making multi-serving meals for several people, the Lux is ideal for smaller meals made for one or two people at most. It can be considered a more streamlined version of the Duo in many ways. It offers six appliances’ worth of functionality compared to the Duo’s 7, and 10 programs compared to the Duo’s 14. Despite the slightly reduced functionality, it still offers the same pressure cooking and other options that the Duo provides, for the most part. In particular, the Instapot Lux excels at making wet cereal foods such as hominy, grits, rice, or oatmeal. If you struggle with cooking in the mornings, simply set up your oatmeal the evening before and set the program to prepare it for your usual wakeup time. You can bake quite easily with the Lux, including cake. Everybody may not like cake, but enough people do that the ability to set one up on short notice should not be neglected. It also includes an egg cooking program, allowing you to have perfectly prepared eggs ready to go with a little effort and time. Combine it with liquid egg and you don’t even have any shells to clean up when you’re done preparing breakfast. We mentioned it already, but it really does bear repeating; the Instapot Lux has a 24 hour cooking delay feature. You can set it up and have it wait to start on your cooking for a full day. This is great if you have time to plan ahead and want to let a good meaty stew soak in its juices, for example. As an added bonus, it can maintain healthy heating of your food for up to 10 hours, meaning a delay in getting to the Lux won’t mean having to put up with a cold meal. It’s a solid companion choice for workers with odd hours, such as newspaper delivery persons. The Instapot Lux includes the same food-grade stainless construction and 3 ply heating bottom. It offers the same even, uniform heating that doesn’t leave some parts of a meal cold or undercooked. The Lux’s computer processor even accounts for food volume, allowing cooking times to adjust properly for the amount of food you’re preparing. Many “budget” slow cookers have only basic high or low heat settings, reducing the precision and efficiency of the cooking process. Cleaning the Instapot Lux is surprisingly easy as well. Simply add two cups of water to the container, seal it, and set the machine to full pressure mode. When it’s finished, remove the lid and give the interior a quick wipe with a damp towel, and you’re set. The high heat and water break up food and kill bacteria, leaving it perfectly ready to cook. Instant Pot’s Lux has the same stainless exterior as the Duo, meaning exterior cleanup is kept to a minimum, as fingerprint buildup is not a problem. The Lux also has the same UL and ULC certified safety features as all Instant Pot models. We keep mentioning it, but it is important to continue to bring up; safety dangers with pressure cookers are very much a thing of the past. With proper use and care, pressure cookers are a very safe way to prepare meals in any home. The Lux includes a full accessory rack, including time table, instructions, steam rack, and Instant Pot approved utensils. Replaces up to 6 other kitchen appliances, including rice cooker and slow cooker. Very sanitary and partially self-cleaning. Can prepare up to 6 quarts of food, enough for several people. Adaptable for modestly sized meals or single-servings as desired. Careful handling is necessary to avoid steam burns. Lid can sometimes be picky as to whether it will close. 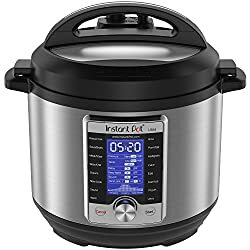 Click here to see the price of the Instant Pot Lux 60 on Amazon. Smart Homes are a growing trend. More people want their appliances integrated into central house experience. We aren’t quite to the point we can approach our appliances and say, “Tea, Earl Gray, Hot,” like Captain Picard, but the Smart Instant Pot does bring us a step closer to the dream. To start things off, the construction of the Smart pot is up to the same standard as Instapot’s other offerings. The cooking vessel is the same food grade 304 strength stainless steel. The advantage here is that unlike other companies, Instant Pot doesn’t rely on chemical coated interiors, meaning no potential for teflon flakes peeling into your food. Heat distribution is just as uniform and high pressure as Instant Pot’s other designs, resulting in well-cooked, safely prepared food. The programming options are a solid step up from the Lux design. 14 different programs are available, giving you more flexibility with the same volume of food as the Lux can cook. The programs are reasonably easy to use, though there is a learning curve the first few times that you use it. Bluetooth connectivity is what makes instapot a smart device. It can be synched to a smartphone app, allowing you to select specific recipes and enable the pot to begin cooking from a distance. No need to get up and hit the button, just program and go. You can even tinker with the scripts if you wish, allowing you more fine control over your cooking process. You can even share your cooking setups with others through the app, getting feedback and insight from other Instant Pot using home chefs. The dual-pressure cooking mechanism allows for sauteing, slow cooking, and warming as needed, keeping food warm for up to 10 hours. The usual 24 hour cooking delay is included as well, allowing you to prepare meals well in advance and trigger them remotely. The usual utensils are included, in particular a custom fitted steaming insert. You can steam vegetables just as easily as you can cook a full stew, making it a very useful replacement for multiple appliances. As expected at this point, the 10-item safety compliance features make it a solid, safe device to use when used properly. Bluetooth functionality and graphical recipe displays make it easy and even fun to use. Single-push cooking programs reduce confusion. Capable of cooking multi-ingredient recipes with very little effort. High quality pressure cooking track record, with fewer complaints from users. Remote time monitoring of meals a definite bonus. The pot does get extremely hot, resulting in potential burn risk and pressure concerns. Pressure cooker explosions can still happen, despite being much rarer. Extremely rare reports of base melting from high heat. Some complications seem to arise when Android users attempt to use the Bluetooth functionality. The Duo Plus was introduced in 2017, and is essentially an upgraded, albeit more expensive version of the Duo pressure cooker. The first thing that comes to mind is the sleek, gorgeous blue LCD screen. LCDs are limited in general, but this one looks very crisp and clear to read. As with other Instant Pots, it can function to replace a number of other devices in your kitchen. You can bake pastries, make yogurt, cook rice, and steam vegetables with ease. It also has the same self-cleaning capability as other Instant Pots. Once again, you simply add water, select the high pressure function, and let it clean itself. A quick wipe of the interior, and it’s ready to go. In a pinch, you can even use it to sterilize silverware and small utensils if you want to be extra sure they’ve been properly cleaned. It’s important to remember that over 75% of the recipes available for the Instant Pot, both in their own recipe book and online, can be completed in under half an hour of cooking. You can even make delicious BBQ ribs in under an hour. It can work as a slow cooker, but it also speeds up the overall process and gives you more control over your time and eating habits. Per usual, the multiple cooking programs can be activated with single button presses in most cases, taking a lot of guesswork out of the equation. Materials and engineering are up to the same high standard as other Instant Pot models, as we’ve come to expect at this point. Heating is uniform, and the 10 integrated safety mechanisms have it certified safe by one of the most demanding authorities for appliance safety out there. It also stresses energy efficiency. 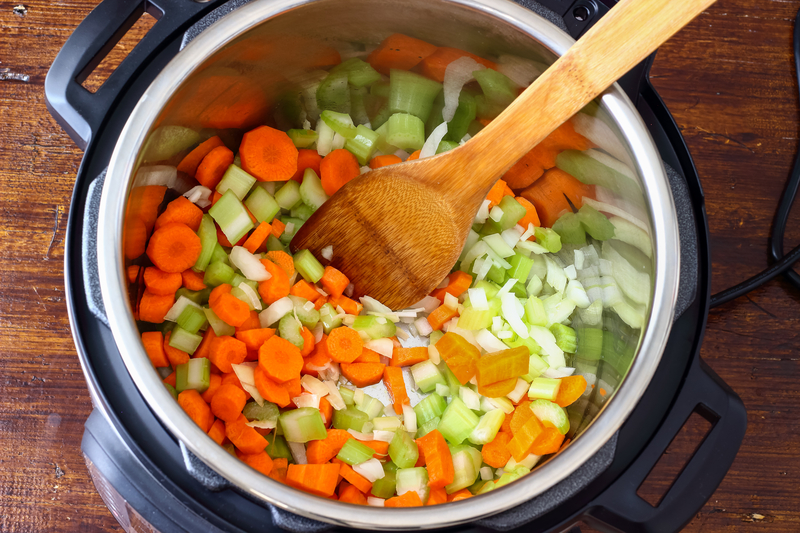 Many slow cookers have to draw power constantly throughout their cooking cycle, but Instant Pots reduce heating during carefully chosen moments through their cycle, allowing pressure and previously generated heat to take over the cooking. This makes them very energy efficient and reduces the cost on power bills. Once again, the Instant pot comes with the full accessory suite that other products come with. However, another bonus of this model is that it partially disassembles, allowing you to wash portions in the dishwasher if you so desire. Can replace 9 other kitchen appliances, including slow cooker, steamer, and rice cooker. Reduces overall space taken up via replacement. One-button recipe cooking very easy to learn. UL certified for safety features. While easy to use, learning curve is slightly steep. Despite easy cleaning, stainless steel is not non-stick, and some food can adhere to pot interior. Rubber sealing gasket has potential to retain food odors and coloration. Instruction manual actually slightly confusing to navigate. There are literally thousands of Instapot pressure cooker friendly recipes available online. The recipe books that Instant Pot includes are appreciated, but cooking with these new generation pressure cookers has become an art form unto itself. As before, let’s consider the example of BBQ ribs. Between preparation of the ribs and sides, cooking time, and clean-up time, anyone who prepares this delicious piece of BBQ heaven can expect to spend at minimum five hours of time on the meal. With only a few minutes of searching, we easily found five BBQ rib recipes (babyback and beef ribs included) that take under an hour with prep and cleaning accounted for. Some adjustment has to be made to account for differences in how a pressure steamer cooks rib meat, but they are delicious recipes all the same, with a great deal to recommend them. The real winning element is how efficient the device is at cooking in multiple roles. If you want breakfast oatmeal, you can have it. So, if you want eggs, there’s settings for that. And, if you want delicious meat, you can have stews or sautéed savoury chunks to your preference. We do acknowledge that there are flaws. Instant Pot has a number of reports of the wiring or electronic components simply failing to work after a certain period of use. These reports are relatively rare, but do crop up enough that we cannot entirely dismiss them from consideration. However, the ability to replace a number of other dishes and appliances in one efficient package is huge. Instapots are a great recommendation for those who love to cook but have limited space, such as those living in efficiency apartments or micro-housing. Notice that there is a great deal of overlap in the two descriptions above. That isn’t just repetition, it’s a sign of how attentive Instant Pot was in designing the Ultra. It doesn’t just prepare these options “with some tinkering.” We can cook porridge or oatmeal in a rice cooker, which works on similar principles to the Instapot. However, there isn’t a button-push program that will let us do this already programmed into the rice cooker. It would take time and effort, and probably some trial and error, to make it work in this way. With the Ultra, it’s one or two presses of a button before you’re cooking with the appropriate settings, and no further input is needed. Mainly, it’s because it combines the best features of all the others into the most complete package. It is slightly larger than other models, but the increase in functionality makes up for the extra space. The additional feature of the quick shutdown steam release function is an added benefit as well. Bluetooth integration and app control at a distance just improve all of this, as we’re all quite fascinated with wireless, smarthome living these days. The Instant Pot is aimed at those looking for efficiency. More functionality equates to more efficiency, so the Ultra wins out in the end over other models to become our editor’s choice. Understand that our choice does not have to be yours. We feel that the Bluetooth capability and myriad functions of the Instant pot Ultra make it the clear standout. However, that is not to say that the other models are bad. Every Instant Pot has its proponents, after all. Perhaps you would prefer the 8-quart capacity of the baseline Duo model. You might like the Bluetooth of Smart model but not feel the need to spend extra on the Ultra. This is perfectly understandable, and you should feel free to make the decision that best fits your needs. However, in the end, we still feel strongly about our choice. We love the Instapot Ultra and we believe you would too. Good luck, and happy cooking.